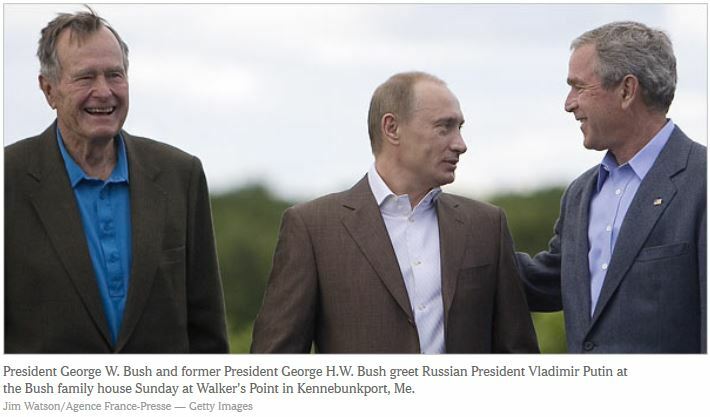 “KENNEBUNKPORT, Me., July 1 — President Vladimir V. Putin of Russia arrived at the Bush family compound here late Sunday for a two-day visit during which he and President Bush were planning to mix the relaxation of family and fishing with the anxiety of a growing list of divisive issues. Mr. Putin’s jet landed in nearby Portsmouth, N.H., where former President George Bush joined him for the helicopter ride back here. Mr. Putin was then delivered by limousine to the Bush home, Walker’s Point, which juts into the Atlantic Ocean in plain view of the main coastal road, to the clear concern of the Russian and American security teams. Soon after he arrived, Mr. Putin was taken on a speedboat ride with the president and his father. On the schedule for later Sunday night was a family dinner of lobster and swordfish with the elder Mr. Bush and Barbara Bush playing host, as they often did here for world leaders when they were president and first lady. Dmitry Peskov, a spokesman for Mr. Putin, told reporters that a topic of discussion was the upcoming national elections in both countries. Also at the dinner were Laura Bush, Secretary of State Condoleezza Rice and the national security adviser, Stephen J. Hadley. Officials from both sides have played down the likelihood that any major agreements will come out of the talks here. President Bush was expected to press Mr. Putin to sign on with a new agenda of sanctions against Iran for its pursuit of a uranium enrichment program. American officials were expecting Mr. Putin to show some reluctance because of his country’s economic ties to Iran, though they have said they see new signs of Russian frustration with the Iranians. Still, officials of the Russian state-owned company helping to build Iran’s first nuclear power station — over the United States’ objections — met Sunday with Iranian officials in Tehran for talks about the project. Mr. Bush and Mr. Putin were also expected to discuss American plans for a missile defense system based in the Czech Republic and Poland, and a Russian counterproposal for a shared system in Azerbaijan. Another likely topic was statehood for Kosovo and Russia’s support for Serbian opposition to it. But both sides have said the meetings are meant to bridge the distance between the nations when tensions between the United States and Russia are at the highest of Mr. Bush’s presidency. Mr. Putin, who is stopping in the United States on his way to an Olympics meeting in Guatemala, proposed the meeting. Mr. Bush then suggested that the meetings be held at the family compound in Kennebunkport, where he rarely goes, preferring his ranch in Texas. Mr. Bush and his father went fishing themselves on Saturday and earlier on Sunday. It was a slightly less serene scene on the streets of this town on Sunday, as hundreds of protesters marched toward the edge of the Bush compound, reaching only as far as police barricades scores of yards away. Carrying signs that read “Impeach the Son of a Bush,” and “Stop the War,” the marchers passed by a couple of dozen war supporters who held a modest counterprotest. “We’re here to show there’s another side of the story,” said Byron Grant, 62, a salesman, at the counterdemonstration. There was some confusion in the demonstrators’ ranks. A young woman sitting peaceably with the war supporters and holding one of their machine-made “Support the Troops” signs and pictures of two soldiers she called “my boys,” said, “I just want them home.” Realizing that she was in the wrong spot, she eventually moved on.